Dinosaurs like you’ve never seen them!For visitors of the exhibition ‘Living Dinosaurs’ in the old postal office on the Coolsingel (Rotterdam, the Netherlands) and especially dinosaur enthusiasts YipYip designed and developed the Living Dinosaurs app. 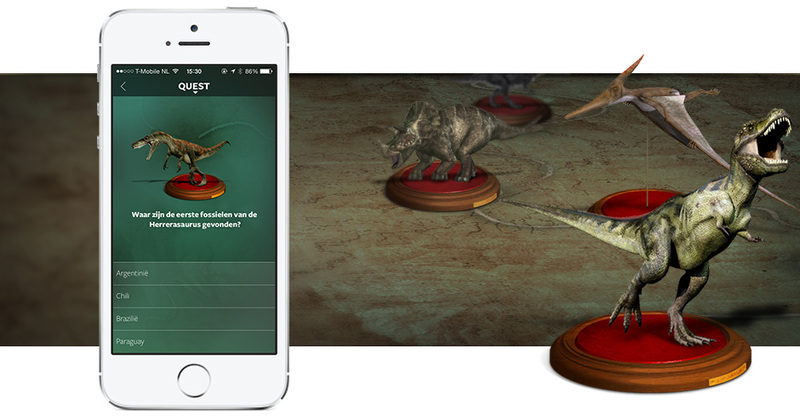 The app contains information about the dinosaurs present on the exhibition and gives visitors the option to take part in an interactive quest. Visitors can take part of an interactive quest through the exhibition that works with iBeacons, small Bluetooth enabled transmitters that can pinpoint the exact position of users. Every dinosaur in the exhibition got an own beacon. The first step in the quest is to find a specific dinosaur, for instance “find the most dangerous dinosaur”. When the dinosaur is found the app automatically enables the dinosaur as an answer and gives a couple of follow-up questions that can only be answered from that specific location. At the end of the quest you’ll receive a nice present. The app contains a Dinopedia, a small encyclopedia about every dinosaur present on the exhibition. You can read fun facts about every dinosaur and browse images. Users that don’t want to take part in the quest are still able to pinpoint their location. The app uses iBeacon in the backgrouns so that it can give information about the nearest dinosaur. This information comes from the implemented Dinopedia. We only implemented iBeacon on iOS devices. To avoid ruling out Android users we also implemented QR codes to scan the specific dinosaurs instead of the Bluetooth location service. The app is available for iOS and Android and can be downloaded for free.